Spectacular views from every floor-to-ceiling sliders. Open and luxurious floor plan. Upper level master suite with king size bed. Master bathroom suite with jacuzzi for two. 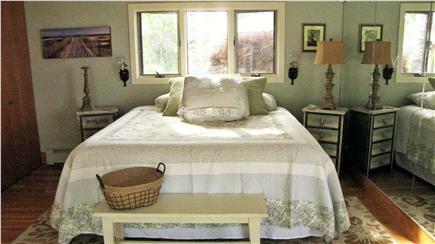 Upper level guest bedroom with king size bed. 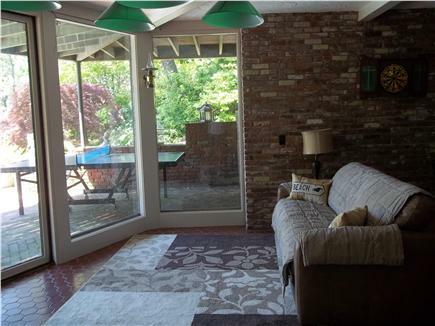 Lower level living area leading to pool (queen sleeper couch). Lush and breath-taking private grounds. Villa Sociedade is one of the few properties on Cape Cod offering two amazing homes (main house: property #21449 & guest house: property #19933). It is the perfect large group solution for extended family, friends, and Fido to vacation together. Each house can be rented separately or together. Both homes are private from each other. They are spacious enough to enjoy each other's company and yet have your own privacy. European design elements provide subtle luxury, warmth, and inviting charm throughout the homes. Majestical grounds. 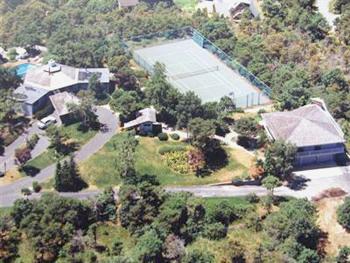 The Villa is nestled on one of the highest points of Truro hills. 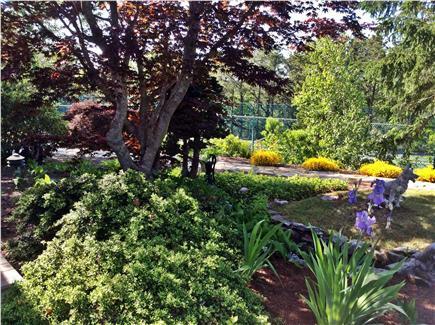 Three beautifully landscaped acres located on it's own private road makes it a tranquil and picturesque setting with spectacular views of Truro. The beautiful grounds will awaken all of your senses. Upon entering the main house the views are breathtaking. You will be taken by the private octagon inground pool and the water view at a distance. There are expansive decks on three sides of this 2+ bedroom, 2.5 bath, contemporary, architect designed home with air conditioning. There is an open floor plan which allows for quiet relaxation or wonderful entertaining. 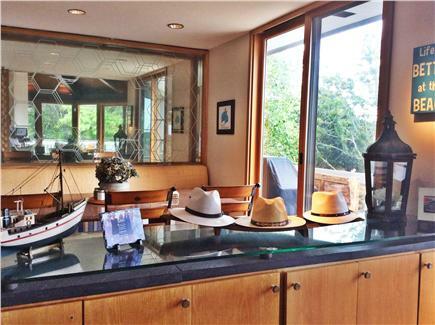 The main level consists of: living, dining, a fully-applianced galley kitchen, and two private bedrooms. The master suite has a king size bed, jacuzzi for two, a separate shower, double sinks and a loo. The guest bedroom also has a king size bed and a full bathroom with shower. 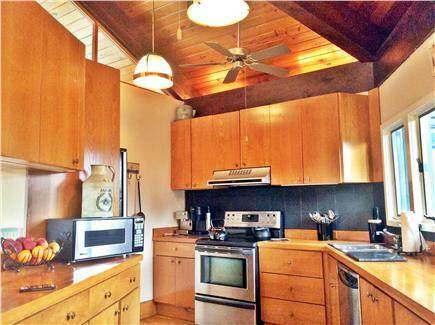 Floor to ceiling sliders, fireplace and wood burning stoves are abundant on this level. A staircase leads to the lower level which consists of: a game room with a wet bar, pinball machine, board games, a quiet area with sofa/queen size sleeper, a separate half bathroom, and a laundry room. Floor to ceiling sliders lead to beautiful outdoor living with inground salt pool, private and very big outdoor shower, tennis court with basketball hoop, ping pong table, hammock, tree swing, fish pond, and gazebo. These are only a few of the amenities available at no extra cost. In an ongoing effort to boast our 5 star rating for providing a well-appointed and pristine home, we have installed touchless flush toilet systems. Wellfleet and Provincetown are about a 10 - 15 minute drive and it is perhaps a mile or so to either Corn Hill Beach on the bay side or Long Nook Beach on the ocean. 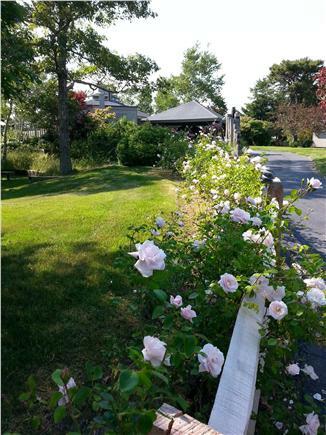 Nearby walking and biking trails through the Cape Cod National Sea Shore? Pet friendly. No smoking. Unique house with beautifully landscaped grounds.This is our 5th year here and we plan to keep coming back to this amazing place with its views, salt water pool, close location to P-Town and Longnook Beach. 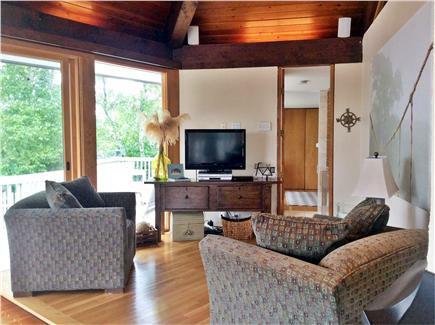 This house has everything you need for a perfect vacation with high ceiling and a wall of glass overlooking the bay. It's so relaxing and Paula is a wonderful host. Thank you for such a great review. We look forward to hosting your next stay! We just spent another fabulous vacation at this amazing home. This home with all of its amenities is like your own private resort. 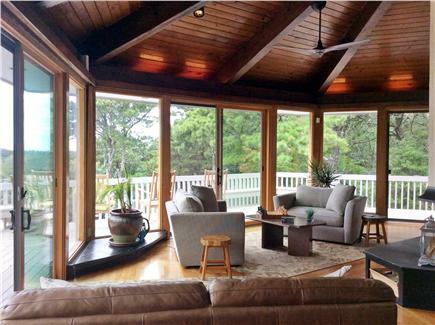 The location is perfect with its access to beaches, restaurants and of course Ptown. There is so much to offer that you could relax by the pool for the day or spend the day at one of the local beaches or go on an shopping excursion. This was my family’s fourth summer stay and every year we discover another beautiful area to visit. This year we watched the sun set at Race Point by a campfire. Thank you for your review and for being such great guests! See you again next year. For 6 straight years, our extended family (all 14 of us) heads to Villa Sociedade. 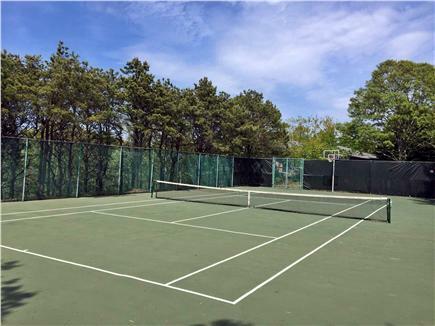 On a stunning piece of property, with incredible amenities (pool and tennis court if you take both houses), in the loveliest part of Cape Cod, it's a vacation we all look forward to. Paula maintains the property beautifully, from the landscaping to the pool maintenance, and she's always making improvements!! Each summer we are excited to discover a new outdoor sitting area, or a brand new basketball net, or a lovely bathroom fixture. She cares deeply about the quality of her guests' experience and is always responsive if a question arises. Thank you for the great review! We look forward to hosting you and your family next year for the seventh straight year in a row! This is our fourth year at this unique house. Its a great place with fabulous grounds, beautifully landscaped with views of the bay. Its very zen-like sitting on the expansive deck watching the sunset with family and a glass of wine. Can't wait to go back! Thank you for your review and we look forward to hosting you again next year! We just spent a glorious week at this lovely place for the second year in a row. The house is a delight - clean, comfortable and elegant, with beautiful views and surroundings. Paula is a helpful, considerate host who thinks of every amenity. If we could give more than five stars, we would! We can't wait to return. My family and I spent a week for the third summer at this beautiful Villa. The venue is perfect for our family as you can spend time at the fabulous surrounding beaches and then return to relax at the luxurious pool setting. Everything you could possibly need is available at this perfect retreat! We are already looking forward to next year's stay!! Thank you for being wonderful guests of Villa Sociedade and for writing an amazing review. We look forward to having you back next year! For our group of ten, we rented both properties at Villa Sociedad. Would highly recommend the combination, if it's available, because the guest house provides a lovely, large, secluded sleeping space (air conditioning works great, it's not too sunny and the beds are very comfortable), and the big house has dramatic vistas, an enormous deck and a beautiful salt water pool to play in. Thank you for such a wonderful review. You are welcomed guests of Villa Sociedade. The main house is simply lovely. 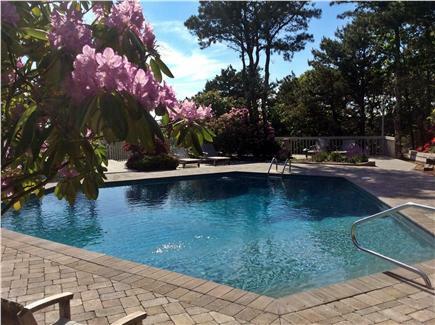 An expansive deck with an everchanging ocean view, a great pool and tennis court, and beautiful surroundings. 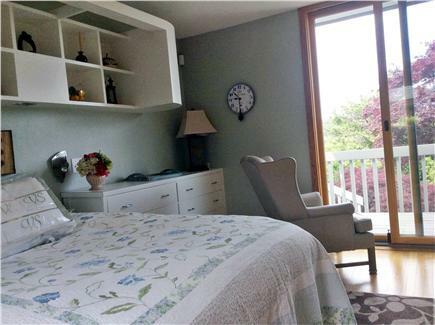 The house has comfortable, pretty furnishings and is very well-equipped for everything you could possibly want in a summer rental. We loved it!! Also, Paula is a gracious and responsive host. Thank you for an amazing review. I look forward to hosting your next vacation. We have been coming here for about four years and have already booked for next year. We stay in the main house with our dog. it is very relaxing and we enjoy the outdoor decks. We love the layout of the house. It is an open floor plan and there is always something new each year. 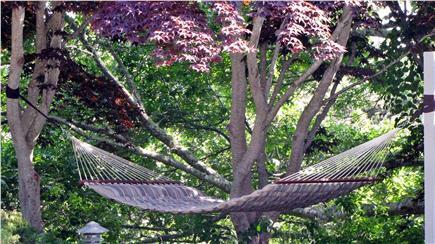 Last year, it was the addition of the saltwater pool and the hammock. 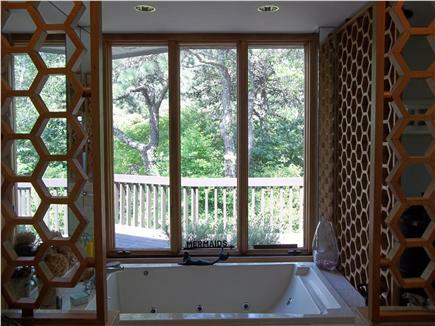 The outdoor shower is wonderful! This year, the downstairs was refurbished.